In Israel we call both the chickpeas (the seeds) and the paste – Hummus. As a general rule – I’d rather cook dried chickpeas after soaking them in plenty of water for at least 12 hours than use canned ones; you can divide the cooked chickpeas into smaller portions and freeze them in ziplocks. For this easy dish, I tossed cooked chickpeas in olive oil, lots of cumin, paprika, sumac spice, fresh minced garlic cloves, salt and black pepper – till it got crispy on the outside. 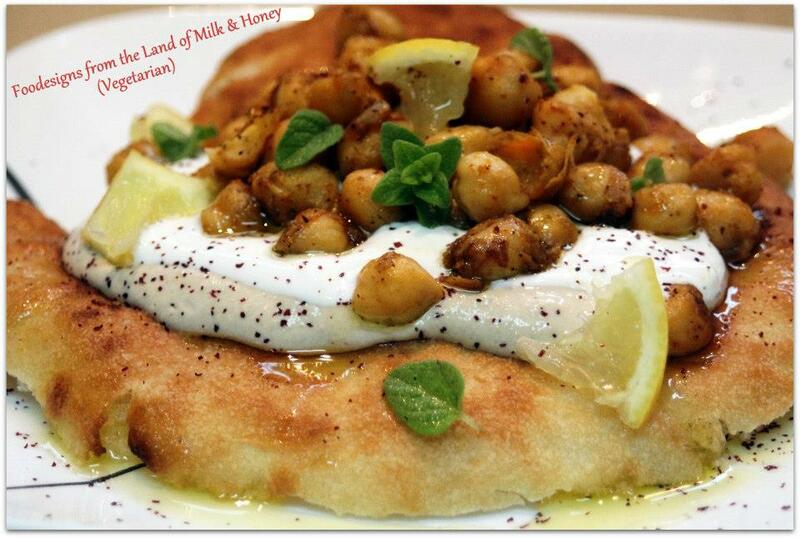 Then I added freshly squeezed lemon juice, fresh Za’atar (hyssop) leaves and served it on Pita bread topped with tahini sauce and thick Goat milk yogurt. This entry was posted in Hummus - and more..., Middle Eastern Food, Tahini - both savory and sweet and tagged Chickpeas, hummus, spices, tahini, yogurt, Za'atar. Bookmark the permalink. Oh no, lovely goat milk yogurt! YUMmy addicting addition.